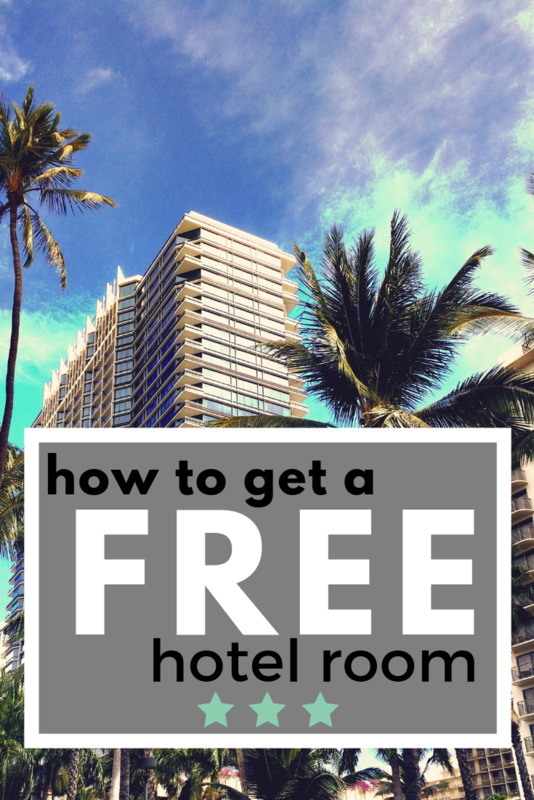 Hotels can get expensive, but what if I told you there were ways to stay at your favorite hotel for FREE? Yes, it’s true, but most of these tips, before you start reading, may take a pinch of spending on your part in order to earn that free hotel stay. And I’m talking any spending. If you’re already using a credit card and/or staying at a hotel, then most of these tips will be right up your alley. Regardless, I wanted to share multiple strategies you can use to start earning free hotel nights. And as long as you spend money on ANYTHING, you can earn free hotel stays with the following tips, I promise. 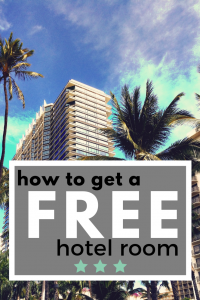 How Can I Get a Free Hotel Stay? Similar to hotels, Airbnb, if you don’t know much about the website, allows you to book rooms or homes directly from the owner, rather than working with a corporation. Picture staying in an apartment or home like you are now. The prices are much cheaper and you may be surprised at the offerings at the destination you plan on visiting. And the cool thing about Airbnb is that they will give you $40 off $75 IF you follow this link, but you do need to be a first-time visitor to the website to take advantage. But better yet, once you create an account and refer friends, they will give you a $20 travel credit per referral, with no limitations. While the $40 off $75 isn’t 100% free, it’s pretty dang close. Invite your friends and you can earn even more. Did you know you can find almost free hotel stays on eBay? Oftentimes people receive a voucher from a hotel and have no use for them. And instead of throwing it in a drawer and letting it collecting dust, many put their voucher on eBay for a few dollars. To find these offers, it’s quite simple. Just search for “free hotel” on eBay and see what comes up. In this case, if I won the voucher for $30, I’m actually MAKING money since I would receive a $50 credit. Your results will vary, but it doesn’t hurt to check out the listings to see what kind of deal you can find. If you book your hotels online, aside from the main hotel chain’s website, then it’s often best to use the same website consistently as many do reward you when you book through their website. From points to free hotel nights, let’s take a look at how some of the big hotel traveling websites can help you earn a free hotel stay. Hotels.com, one of my favorites, will give you a FREE hotel night for every 10 nights you book directly on their website via its Hotels.com Rewards program. You get to choose how you collect 10 nights, and once you do, the website will take the average price of the 10 nights and reward you with a voucher. To make it easy, if you spent $100 ten times, then your free voucher would be worth $100, in which you could use at ANY hotel in the company’s database. To learn more about how you can earn a free night with Hotels.com, you can do so here. The Orbitz Rewards program offers three membership tiers: silver, gold and platinum status, each with its own perks. And whenever you book directly with Orbitz, you can either earn 3% back if you book via the desktop site or 5% back if you book via the app. So if you spent $100 a night via the app, you could earn 5 “Orbucks” back into your account. Upon booking, these “Orbucks” are deposited into your account immediately, allowing you to put them toward a future trip without completing the first one. In essence, one Orbuck will equal $1 off and you can either use it to pay for the entire booking or just a portion. It’s really up to you. To learn more about the program and/or sign up, you can do so here. If you use Expedia for your hotel bookings or any sort of travel in that regard, then I highly recommend you sign up for a free Expedia Rewards account. From my research, however, this isn’t the best third-party booking reward program, though. For every dollar you spend on a hotel, Expedia will give you two points. And to redeem these points for a hotel stay, you will usually receive about 0.71 cents per point, however, if you book a VIP Access hotel, then Expedia will double this point value. You will be able these hotels by searching here. So, if you booked a VIP Access hotel, it would take about 140 points to receive $1 off, but it would take 280 points to earn $1 off if you booked a non-VIP Access hotel. You can learn more about the rewards program and how it works here. Priceline doesn’t have its own rewards program, but you could consider the Priceline Rewards™ Visa® Card, which earns you 5 points for every dollar spent on Priceline.com purchases. Do I recommend it? Not really as there are much better cards, but if you’re loyal to Priceline, then I suppose you could consider it. Every point is worth one penny, and when redeeming, you can get 10% points back every time you redeem for a statement credit toward eligible Priceline.com or travel purchases of $25 or more made in the last 120 days. While Priceline doesn’t have a free reward program, you may want to check out the credit card if you use the website consistently to earn points. If you’re using any of these travel booking websites, make it a habit to use cash-back websites, such as eBates, to earn cash back. 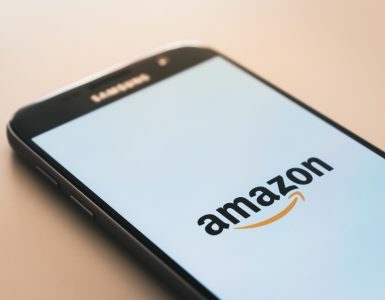 In doing so, you can earn an additional 5%~ cash back on your purchases AND you can earn the points from the website, essentially doubling down your purchase. By far, this is my favorite AND easiest way to earn a free hotel stay, and with a hotel credit card, you can earn free hotel nights in two ways. For one, hotel credit cards are almost always offering a sign-up bonus if you spend a certain amount. This could be $1,000, $2,000 or $3,000 in the first three months of opening the card, for example. Then, if you meet the spending requirement (trust me, it isn’t hard — just put your monthly bills on it), you will get the bonus, which can be equivalent to as many as 10+ free hotel nights. For instance, when I was writing this guide, you could earn 80,000 bonus points with the IHG Premier Rewards Club card if you spent $2,000 in the first three months. And how much are 80,000 points worth? Depending on where you want to stay and which IHG hotel you choose, redemption rates can start as little as 5,000 points if you took advantage of what’s known as the PointBreak hotels. In essence, 80,000 points could net you as many 16 FREE nights if you signed up and spent them on 5,000-point hotels. I will get into all of this below. With a variety of hotel credit card options out there, I wanted to break down the cards in alphabetical order along with the potential signup you could receive. As part of the Choice hotel brands, cardholders will receive two points per dollar on all purchases, but if you’re a Choice Privileges member, you can receive up to 15 points per dollar spent at eligible Choice Privileges locations. With no annual fee, additional benefits include roadside assistance, 24/7 concierge service and automatic Elite Gold status. How many points do I need for a free hotel night with the Barclays Choice Privileges Visa Signature Card? Researching the Choice Hotel website, redemption rates ranged anywhere from 8,000 to 30,000 points, and like most hotel redemption programs, this would all depend on which hotel you wanted to stay at. Using the math above, you would need to spend about $4,000 on everyday purchases to earn a free night, but if you solely used the card for Choice hotel purchases, then it could be much less. To learn more about the card and the signup bonuses you could take advantage of, you can find out more about the card on the official website. The Capital One® VentureOne® Rewards credit card has no annual fee and offers 1.25 miles per dollar spent and a bonus 10 miles per dollar spent when you use hotels.com/venture. So if you spend $2,000 a month on bills and randomness, then you could earn 2,500 miles essentially. But let’s say you spent $200 on hotels for the month using the Venture Hotels.com portal, this could add another 2,000 points to your balance since you’re able to snag 10 miles per $1 spent. If you do sign up, Capital One is always offering some sort of sign-up bonus to maximize your savings. How many points do I need for a free hotel night with the Capital One® VentureOne® Rewards Credit Card? To figure out how many points you need, the formula is rather simple. Head to the hotels.com/venture link and input the information to see what the hotel will cost. Then, multiply the total dollar amount by 100 get an idea as to how many points you need. So if the hotel was $88, then you would need around 8,800~ points, etc. To learn more about the card, you can do so here. The Chase Sapphire Preferred® Card nets you two points per dollar on travel and dining and one point per dollar on all other purchases. So if you spent $300 on dining and another $2,500 on other purchase in the month, this could essentially net you a total of 3,100 points per month [(600×2)x2,500)]. Then, once you earn enough points, you can transfer all of these points to multiple travel partners at a 1:1 ratio, or if you really want to maximize the card, Chase will offer you 25% more in value if you use the Chase Ultimate Rewards portal. How many points do I need for a free hotel night with the Chase Sapphire Preferred® Card? Go to Expedia (this is Chase’s partner) and search for a hotel you want to stay at. Then, with the rate, multiply that number by 100. So if the rate was $84 a night, it would cost you 8,400 in points, meaning either $8,400 in non-dining and travel purchases OR $4,200 in dining and/or travel purchases in total. Or if you combine them, just remember the dining/travel purchases will net you two points instead of one. However, when doing the math, do keep in mind that this card DOES have an annual fee, so just make sure it’s worth it. As you can see, this can really add up, especially if you use your credit card for all of your bills and so forth. And if you’re interested, this card is ALWAYS offering a sign-up bonus, sometimes in the tune of 50,000 to 80,000+ bonus points when you spend a certain amount. If interested, head to the official application page for more information. The Hilton Honors American Express Ascend Card nets you 12 points per dollar at Hilton properties, six points at restaurants and three points per dollar on all other purchases. It also offers additional benefits, such as automatic Gold status, car rental loss/damage insurance and 10 free Priority Pass airport lounge passes. How many points do I need for a free hotel night with the Hilton Honors American Express Ascend Card? Most good Hilton hotels start at 30,000 points, but higher-end properties can be much more. If we take our formula mentioned above, you would have to spend $10,000 in non-restaurant/Hilton purchases to earn a free 30,000 night. And of course, if you use your card solely on restaurants, then this number is instantly cut in half due to the six-point per dollar redemption rate. The card does come with an annual fee, with a sign-up bonus offered quite often. To learn more about the card, visit this AmericanExpress.com page. The World of Hyatt Credit Card offers four points per dollar spent at Hyatt properties, 2 points per dollar spent on transportation, restaurants, airline tickets, and gym memberships, and one point per dollar for everything else. And cardholders are automatically converted to Disoverist status in the World of Hyatt program plus a free category 1-4 hotel night every year your card renews. How many points do I need for a free hotel night with the World of Hyatt Credit Card? Redemptions can range anywhere from 5,000 to 30,000+ points a night, greatly depending on the hotel you choose. If you used the card for everyday spending and earned one point per dollar, then it would take close to $5,000 to earn a free night. However, if you mix in restaurants and some Hyatt properties, then it could be much less than this. The card does have an annual fee, and if you want to learn more about the card, you can do so via Hyatt.com. The IHG® Rewards Club Premier Credit Card will earn you 10 points per dollar spent at IHG properties, two points per dollar spent at a gas station, grocery stores, and restaurants, and one point per dollar on everything else. Additional card benefits include a free nightly stay every year on your card anniversary as well as trip cancellation insurance, baggage delay insurance and even price protection insurance. The card does have an annual fee, but most feel the free night offsets the fee if you use your voucher wisely. How many points do I need for a free hotel night with the IHG® Rewards Club Premier Credit Card? Depending on the IHG brand and which one you choose, most redemptions usually start at 15,000, but sometimes they can be less. As a safe estimate, however, let’s use the 15,000 point example. To receive your free IHG night, you would have to either spend $15,000 on non-gas, grocery, restaurant and IHG purchases or half that if purchasing gas, grocery or restaurant-related items. Mix everything in between and you’re probably looking at about spending $8,000 to $10,000 based on regular spending habits. Of course, it could be much less if you use the card at IHG consistently and/or use it on groceries, gas or restaurant purchase more than the average person. IHG seems to always offer a great sign-up bonus, with point bonuses as high as 80,000 points sometimes. In the end, $8,000 in spending could net you a decent IHG stay, but it will greatly depend on your budget. To see the current sign-up bonus and to learn more, you can do so here. The Marriott Rewards® Premier Plus Credit Card earns you six points for every dollar spent at Marriott and SPG hotels and two points per dollar for all other purchases. How many points do I need for a free hotel night with the Marriott Rewards® Premier Plus credit card? As I get into below, the cheapest hotel I could find in terms of point redemption was 7,500, but it could be much higher like most of these other hotel cards. So at a minimum, plan on spending $3,750 before you can even redeem a free night or much more if you want a higher-tiered hotel. But the good news here is that as long as you renew your card (the annual fee is $95), Marriott will give you a free voucher, automatically earning you a free night at select hotels. The Platinum Card® from American Express earns you five points per dollar spent via AmexTravel.com or one point per dollar spent on all other eligible purchases. And while the annual fee is hefty ($550 at the time of this blog post), you can earn additional benefits such as $200 in Uber savings annually, a $200 airline fee credit and a $100 fee credit toward Global Entry or TSA Precheck, sometimes making this annual fee worth it, depending on how much travel and how much spend annually. Cardholders can also take advantage of other benefits such as resort and hotel benefits, including complimentary breakfast, late check-out and room upgrades, to name a few. There are quite a few benefits and you can check out the full list here. How many points do I need for a free hotel night with the Platinum Card® from American Express? According to the official AMEX calculator, every 10,000 membership points are worth $70 when you book through American Express Travel. Simply put, if you just use this card for everyday purchases, then you will need to spend about $10,000 for a $70 hotel night stay. And remember, the annual fee is HUGE, so make sure your spending makes sense here. For more information on the Platinum Card® from American Express, you can go here. 2 points per dollar spent on all purchases, with the exception of purchases made at Choice Hotel properties as these purchases could net you 15 points per dollar. For a minimum redemption of about 8,000 points, plan on spending close to $4,000 on everyday purchases. 1.25 points per dollar spent unless you use the special Capital One Hotels.com link; this earns you 10 points per dollar. Each point is worth $0.01, meaning you would need 6,400 points in non-hotel spend for an $80 hotel night. As long as you book a hotel through Chase travel, every point is worth about $0.01. Earn 2 points on travel/dining and 1 point for everything else. If you wanted an $80 hotel night, then you would need to spend $8,000 in non-travel/dining to redeem. 4 points per dollar spent at Hyatt properties, 2 points per dollar spent on transportation, restaurants, airline tickets, and gym memberships, and one point per dollar for everything else. For a low-tiered hotel around 5,000 points, be prepared to spend, at most, $5,000. It could be much less if you spend money at Hyatt hotels and restaurants, for example, but it could be much more if you wanted to redeem at a 15,000+ point hotel, etc. Earn 10 points per $1 on IHG purchases, 2 points per dollar on gas, restaurant, grocery or 1 point per $1 for everything else. The average card user should expect to spend about $8,000~ for the average 15,000 point redemption. Earn 2 points per $1 on all purchases, but 6 points on Marriott/SPG purchases. Since the cheapest redemption is said to be 7,500 points, you would have to spend $3,750 to earn enough points if you use your card on non-Marriott/SPG purchases. 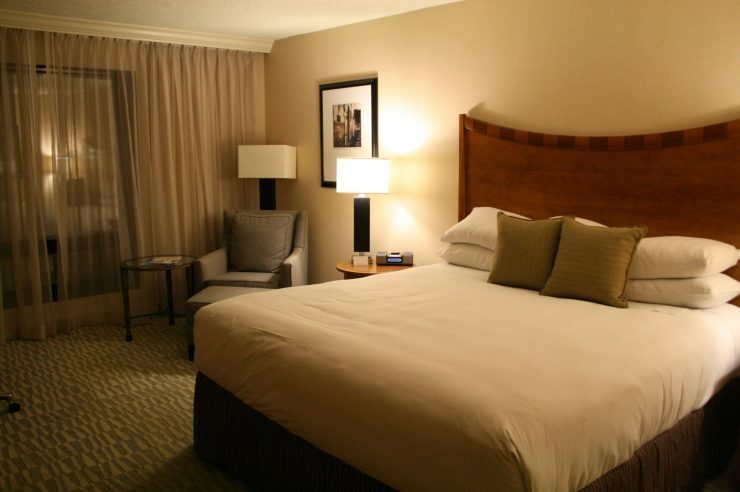 Renew your card and pay the annual fee and Marriott will give you a free night with restrictions annually. Earn 1 point per dollar spent or 5 points per dollar spent on AmexTravel.com. Every 10,000 points equal $70 in hotel value when you book via AmexTravel.com, meaning you will need to spend $10,000 in non-travel for a free $70 hotel night. All of your major hotel chains, such as Marriott and Hyatt, offer hotel loyalty programs for their customers, and the best part about joining these programs is that it’s 100% free. And all of these hotel loyalty reward programs work in a different way as some may offer more than free hotel stays, which I will talk about below. For every dollar you spend AT the hotel, you will earn X points. And once you earn enough points in your account, you can then redeem these points for a hotel via the company’s hotel search engine. So while these are free hotel stays essentially, you will need to spend money at the hotel. I just wanted to include these reward programs because there are so many programs you can join to easily earn a hotel night, especially if you travel a lot. And if you want to maximize your points, you can consider the hotel-affiliated credit card as mentioned above and earn points every time you swipe your card, no matter where you are. For example, the IHG Premier credit card will give you 10 points per $1 spent at any IHG property, 2 points per $1 spent at any gas station, grocery store and restaurant, OR 1 point per dollar spent on all other categories. A credit card isn’t required as you can still earn points; however, you will only be able to earn points when you’re spending money at the hotel only, simply meaning it could take a pinch longer to earn your free stay if you don’t use a credit card for everyday spending. How many points will I need for a free hotel stay? Like searching for a hotel when paying cash, a three-star hotel in the middle of Iowa could cost $125 a night, whereas a hotel in New York City during New Year’s Eve could cost close to $1,000! Redeeming points will work in the same way as it will greatly depend on the city, the time of year, which hotel brand within the brand you want and what kind of room you need. Again, a hotel makes it really easy to see how many points you may need via their official search engine and you can even use the search engine if you don’t have any points on your dashboard. As you can see, I would at least 5,000 points to stay at the hotel for free. If you have a specific brand you like or stay at quite often, then I highly recommend you sign up as soon as possible to start taking advantage. And if you’re going to spend money at the hotel, you might as well start gathering points — again, it’s free! As there are quite a few hotel chains, I wanted to break each program down, in alphabetical order, and how you can take advantage to start earning free hotel stays. To be safe, always book your hotel directly through the hotel’s website to earn your points. DON’T use third-party websites as companies WILL NOT give you points in doing so. With some programs, your points may expire if you’re inactive. Be sure to read the fine print so that your points don’t go to waste. Just be active every 12 months to avoid this. If it makes sense, sign up with the hotel affiliated credit card to maximize your points. I would only recommend if you plan on staying at that brand exclusively and the points/annual fee makes sense. All hotel chains have their own membership tiers. The more nights you stay per year, the more benefits you can earn, such as early check-in, free WiFi, free upgrades and more. Check these benefits out to see if it’s worth working your way up the rank. Now that I’m done talking about how these loyalty programs work, let’s dive into the most popular programs and what you may need to spend to earn your free night. Just remember, keep these tips in mind if you’re considering signing up. Geared toward those who travel on a budget, the Best Western Rewards program lets members redeem free hotel stays at more than 4,200 Best Western hotels in more than 100+ countries. And asbide from earning points at the hotel chain, you can also earn points by using Best Western partners, such as car rentals and shopping. For every dollar spent when booking directly at BestWestern.com, members will earn 10 points, while Best Western Rewards MasterCard can earn up to 20 points per dollar spent. And to redeem your points, redemptions typically start at 12,000 points and can be as much as 36,000 points, all depending on where you stay. How much do I need to spend to earn a free Choice brand hotel stay? Without a credit card, the average Best Western stay is typically around $80, meaning you will earn about 800 points per stay as long as you book direct. Redeeming at 12,000 points at a minimum, it would take close to 15 stays to earn a free night at a Best Western on the lower end. Of course, this redemption rate could drop if you were to sign up for the credit card and/or spend more than $80+ per night. The same can be said if you were to book/buy directly through the company’s shopping portal. Probably the most budget-friendly hotel chain on this list, the Choice brand includes more than 5,000 participating hotels, including popular brands such as the Comfort Inn and Econo Lodge. To earn points with the Choice hotel brand, you will earn 10 points for every dollar you spend, including dining, laundry and even phone call charges. Aside from hotel stays, the company allows you to earn points when you book cruises, stay at select Bluegreen Vacations resorts and even buy Amtrak train tickets. You can find all of this information via the company’s Choice Privileges page. And if you consider the credit card, you can earn 15 points per $1 spent at eligible Choice Hotels, with bonus points often available. You can start redeeming points at any Choice hotel property at 8,000 points, but some properties can be as much as 30,000. Again, greatly depends on your choice. Being a budget-friendly hotel chain, the average Choice hotel will cost about $70 a night, meaning you will probably earn 700 points per stay most of the time during your stay. At 700 points, it would take about 11 to 12 nights to earn a free low tier stay. Or in the case of a $140 a night room, it may only take six nights instead. Additionally, you can earn even more points, as mentioned above, if you were to book a rental car or even shop at an authorized retailer through the Choice Hotels shopping portal. The same can be said if you were to consider the hotel’s credit card, too. With over 5,000+ properties across 100 countries, the Hilton Honors reward program allows members to not only redeem their points for free hotel stays, but the points can also be used for concert tickets, sporting events and even Amazon via the hotel chain’s shopping portal. And aside from booking free Hilton hotel stays, members are given the opportunity to cash their points in for free airline miles or even unique experiences. When earning points at any Hilton brand, the company will reward you with 10 base points for every dollar spent at a Hilton-affiliated property, including the Waldorf Astoria, DoubleTree and Garden Inn, for example. And in addition to earning these base points, you can also earn points via promotional offers and/or spending money through third-party partners, such as select airlines and car rental companies. To see a full list of the company’s partners, you can do so here. As for redemption, the redemption rate GREATLY depends on the specific Hilton brand and where you plan on staying. On average, however, the cost of a room in points seems to be in the 17,000 to as much as 475,000 points! However, the sweet spot seems to be in that 30,000 to 50,000 range. To see how much a room may cost specifically in points, I highly encourage you to check this resource out via the official website. How much do I need to spend to earn a free Hilton hotel stay? The rates are going to vary as a DoubleTree stay can cost about $125 a night while a Waldorf Astoria stay could cost north of $250 a night easily. But let’s say your average night will cost $130 a night. In this scenario, then you would earn 1,300 points without any promotions and/or Hilton-branded credit card. If you wanted to redeem a 30,000 point hotel, you would have to stay 23 nights to claim your redemption. Again, I can’t stress it enough. YOU can get closer to this redemption rate if you use the credit card and/or spend money with the chain’s partners. The Hyatt brand boasts more than 700 properties, spanning across the globe, from the United States to Europe and Mexico. And as a member, you can accumulate points to either redeem free Hyatt hotels stays, room upgrades, car rentals, airline miles or even spa services. To earn Hyatt points, members will receive 5 points for every dollar spent at a Hyatt property, but in order to receive these points, however, YOU MUST book directly through the official Hyatt website. Aside from the Hyatt, members can also receive 5 points at 12 Las Vegas-based MGM Resorts International properties that participate in the M Life Rewards program. How much do I need to spend to earn a free Hyatt hotel stay? Depending on where you stay, it’s safe to say the average Hyatt hotel stay will cost you about $130, which would earn you 650 points per stay. To redeem, redemption rates range anywhere from as little as 5,000 points to as much as 30,000 points, but if you don’t mind staying a lower-end hotel, which is often on the outskirts of major cities, then you could do quite well! Doing the simple math, you would need to stay about 8 nights to earn a free 5,000 point night, but it could be less if you spend more than the average $130 per night. And again, this math is simply based on if you DON’T have the Hyatt credit card. If you decided to sign up for the Hyatt credit card, you could earn points much quicker. The InterContinental Hotels Group’s Rewards Club offers more than 5,400 properties, including well-known names such as the Holiday Inn, Crowne Plaza and Kimpton hotel brands. And to earn points at any IHG branded hotel, the rate will greatly depend on the brand you stay at. For instance, Staybridge Suites will net you 5 points per dollar spent, but if you stay at a Holiday Inn property, you will earn 10 points per dollar spent. Aside from earning points for your hotel stay, the company will also reward you for using their partners, such as multiple retailers and food delivery companies like GrubHub. You can browse the company’s partners here. How much do I need to spend to earn a free IHG hotel stay? The redemption rate for an IHG property will, like all of these hotels, GREATLY depend on which hotel chain you choose and the time of year you want to stay. At a minimum, be prepared to need at least 10,000 points for a lower tier to as much as 70,000 points for a higher end property. With IHG hotels often in the $120 to $160+~ a night range, it’s safe to say you will earn about 750 points if earning 5 points per night or double that, 1,500 points, if staying at a Holiday Inn, for instance. So for scenario purposes, if you stayed at a Holiday Inn and spent an average of $120 a night, you would need to stay close to 9 nights to earn your free night. Of course, signing up for the IHG credit card and/or using the hotel’s partners can earn you points much quicker. For example, signing up for the IHG Premier Rewards Card could net you 10 points per dollar spent at an IHG property. But better yet, the card also includes a free hotel night every year AND if you redeem points for more than 4 nights, you get the fourth night free. The La Quinta chain, targeted toward the budget-conscious traveler, includes more than 850+ properties throughout the United States. And as a member, La Quinta members can earn points for every qualified stay at any La Quinta property, as well as luxury brands, such as the Omni San Diego Hotel and The Signature at MGM Grand in Las Vegas. And to earn points with La Quinta, the hotel chain will reward you with 10 base points for every eligible stay. However, if you’re a Gold or Elite member, you can earn even more points of each stay, with ELITE status members earning 30% bonuses on all base points. To learn more about the La Quinta program, you can do so via the official website. As far as redeeming goes, free nights typically start at 6,000 points but can be as much as 24,000. These points, like all of the hotel chains I mention, will depend on the location. How much do I need to spend to earn a free La Quinta hotel stay? Assuming you’re just starting out, you will earn 10 base points per stay, and with the average La Quinta costing about $90~ a night, meaning you could earn about 900 points a stay. At 900 points, it could about 7 nights to earn a free La Quinta night. However, if you want a higher tiered hotel and/or you use the company’s credit card, then it could cost more or even less. Your results will vary. With more than 6,500 participating hotels in its network, Marriott Rewards members can earn reward points on more than 29 affiliate hotel brands, including The Ritz-Carlton, Westin and Renaissance, to name a few. To earn points, it will depend on a variety of factors, such as how you’re paying for the hotel and which hotel you’re staying at. On average, you will earn about 10 points for every dollar spent on your hotel stay, but some brands, such as the Residence Inn and TownePlace Suites, will only earn you 5 points per dollar spent at the hotel. As long as you’re spending money inside the hotel, you’re earning points. On the low-end, if you strictly spend money at the hotel without a Marriott-affiliated credit card, let’s say you earn 5 points per dollar spent. Signing up for the Marriott card, however, could earn you even more. To redeem these points, as I already mentioned, will greatly depend on how the hotel is ranked as a lower-end hotel will only require 7,500 points, while a higher-end hotel could cost as much as 100,000. Marriott, as I write this, offers seven total categories, with each tier offering its own redemption rate. So when you’re ready to redeem, it’s rather easy as you can search for a hotel on the official Marriott website as you would normally book a hotel, but instead of searching for the cash rate, you can search for the points rate to see how many points you will need. How much do I need to spend to earn a free Marriott hotel stay? In conclusion, to earn a free night at a Marriott hotel, WITHOUT any Marriott-affiliated credit card, you will need to spend about $1,500 at a Marriott to earn a 7,500 point hotel stay. This is on the very low end. Since the average Marriott can cost about $150 a night, this could mean you could maybe earn a free Marriott stay every 10 nights you stay at one, again, without a credit card. Now, if you use the Marriott branded credit card, you could accelerate your earnings, earning as much as 6 points per dollar spent at Marriott or two to four times more in other categories. To learn more about the Marriott branded credit cards, you can do so via Chase.com. And aside from the points, you can earn even more benefits as you move up the ranks, which depends on how many nights you stay at a Marriott for the year. With more than 1,100 properties located across the world, this Radisson Rewards program is ideal for those who stay at Radisson properties, such as the Country Inns, the Radisson Blue or Park Inn, to name a few. Earning points every time you book a room direct with Radisson and make any purchases within the hotel, the hotel will reward you 20 points per dollar spent. If you spend money on dining, it needs to be charged to your room in order for it to qualify. With multiple reward tiers, it is possible to earn up to 35 points per dollar spent if you stayed 60 nights a year, for example. You can learn about the tiers here. And aside from the typical hotel stays, Radisson will also reward you with points if you book a rental car or shop through their rewards website. You can see all of their partners here. To redeem your points for a free night, the cheapest nights I could find were in the 15,000 points range, but it could be as much as 105,000 points. How much do I need to spend to earn a free Radisson hotel stay? Depending on the location you choose, the average nightly rate seems to be about $85 a night, meaning you probably could earn close to 1,700 points per stay without any added credit card benefits. With the lowest tiered hotel redemption being 15,000 points, you would need to stay about 9 nights to earn a free night. Again, this is for the lowest tier and wouldn’t include any additional points if you were to earn them through the hotel’s credit card and/or partner portal. Signing up for the credit card, for instance, could earn you additional points. As a Wyndham Rewards member, you can stay at more than 8,000 properties, including the Days Inn and Ramada, to name a few. And to earn points with the program, you can do so through every qualified stay at a Wyndham hotel, which must be booked directly via the official website. Simply put, this means any bookings made via a third-party website WILL NOT earn you points, so keep this in mind. Without an affiliated credit card, Wyndham will reward you 10 points for every dollar you spend toward the room costs or 1,000 points, whichever is higher, which simply means you will always, at a minimum, earn 1,000 points per stay. And aside from hotel stays, the company will allow you to earn points via various airlines and even up to 500 points when you book a car with one of their car rental partners — Avis and Budget. How much do I need to spend to earn a free Wyndham hotel stay? Wyndham hotels tend to be on the lower end, but as I mentioned, you will always earn at least 1,000 points per stay, equivalent to about $100 in hotel spend. Like most of the hotels I listed, most of the free hotel stays for the Wyndham brand, referred to as a free reward, would require 15,000 points or about 15 $100 stays on average. However, this average could drop quite a bit if you spend more than a $100 a night. So if you’re going to just spend money at a Wyndham property and don’t plan on signing up for the Wyndham credit card to maximize your points, then $1,500 will equal one free room at just about any hotel in the company’s network. Aside from redeeming free hotel stays, the company also allows you to redeem your points for free gift cards, merchandise, airline tickets and more. Plus, since the company partners with the Caesars Entertainment’s portfolio of hotels, you can redeem your points for these hotels as well. In essence, you can earn free hotel nights as long as you sign up for the free hotel loyalty program and you use your membership number each time you stay with the brand. Remember, these programs are 100% free and require no credit check. Simply sign up either online or in the hotel to start earning your points. Now, if you don’t want to read all of the quick recaps of the loyalty programs mentioned above, then the table below will show you how many times you probably would have to stay if you DON’T have the hotel affiliated credit card. In simple terms, here’s how many nights you probably have to stay to redeem your points for a lower-end redemption. This number, however, could be smaller, if you spend more per night at the hotel. This is a LOW BALL estimate. If you want a higher tier, then plan on staying even more nights. I just wanted to include what it could take, at a minimum, to earn a free hotel stay. Spend $80 a night on average, it would take 15 stays to earn a 12,000 point low tier free hotel stay. Spend $70 a night on average, it would take 11 stays to earn an 8,000 point low tier free hotel stay. Spend $130 a night on average, it would take 23 stays to earn a 30,000 point low tier free hotel stay. Spend $130 a night on average, it would take 8 stays to earn a 5,000 point low tier free hotel stay. Spend $120 a night on average at a Holiday Inn, it would take 9 stays to earn a 10,000 point low tier free hotel stay. Spend $90 a night on average, earning 10 points per dollar, it would take about 7 stays to earn a 6,000 point low tier free hotel stay. Spend $150 a night on average, earning 5 points per dollar, it would take about 10 stays to earn a 7,500 point low tier free hotel stay. Spend $85 a night on average, earning 20 points per dollar, it would take about 9 stays to earn a 15,000 point low tier free hotel stay. Spend $100 a night on average, earning 10 points per dollar, it would take about 15 stays to earn a 15,000 point low tier free hotel stay. NOTE: You can easily stay fewer nights if the nightly average is higher and/or you sign up for the hotel’s credit card and/or book/buy directly with one of the hotel’s partners. I just created this simple table to give you an idea as to how many nights you would probably have to stay with that particular chain if you do decide to sign up with the company’s loyalty program. A mystery shopper is responsible for evaluating customer service and product quality, all while undercover. While most people often associate mystery shopping with shopping at the grocery store or eating a restaurant, some companies specialize in the hospitality industry. Like a job, you will first apply with a mystery shopping company, and since there are multiple options, you’re not limited to just one. Next, if you’re approved, then you will be able to tap into the mystery shopping database, where you can browse the jobs available in your area. Now, it’s not just a click on the job and start working as some companies may require you to go through some sort of training before you can start working with that client. Regardless, if you want to become a mystery shopper for a hotel chain, you can not only get a free hotel say, but you will get PAID for doing so as well. Some report getting paid as much as a few hundred dollars — not bad! Just keep in mind that if you do decide to be a hotel mystery shopper, you will have to often fill out long reports and detailed in your assessments, so, unfortunately, you won’t be able to lounge around the entire time. On these websites, just look for the “sign up as an evaluator” link, fill out an application and see if they accept you! Honestly, mystery shopping in itself can be a whole another post, but in the meantime, I highly recommend checking out MysteryShopForum.com for TONS of information. If you truly want a 100% free hotel option and don’t mind sitting through a two- or three-hour presentation, then you may want to consider attending a timeshare presentation. In some cases, however, you may have to pay a small fee, but regardless, it’s often worth it. And while it can be worthwhile, you do need to keep in mind that these sales professionals are often very aggressive and won’t take no for an answer. So if you can sit through and say no a million times, then it may be something to consider. To find these timeshares, it can be done in a variety of ways. Once you sign up, you should start receive e-mails and even direct mail in relation to upcoming pitches. Aside from contacting these companies, you can often find salespeople in popular tourists destinations at a booth, such as Las Vegas, or a simple Google search could suffice as well. Again, if you don’t mind high-pressure sales presentations, then this could be, by far, one of the easiest ways to snag a free night. This one can be sort of a stretch, but I wanted to include it as some hotel chains do reach out to influencers in exchange for a free hotel room. You can find these chains as well, but it will take some work and you will need to fit the chain’s demographic. For example, Marianna Hewitt, a lifestyle blogger, was able to snag free hotel nights solely based on her Instagram fame. 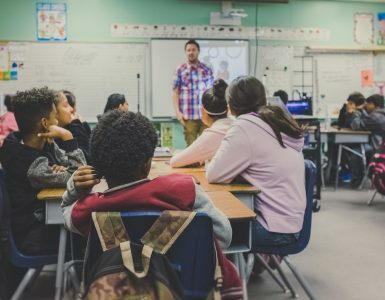 Again, I know it’s a stretch, but if you’re reading this and have more than 50,000+ legitimate followers, then I would recommend checking out this HubSpot guide as to how to find sponsorships. As much as I would love to offer you a free hotel stay coupon code, it’s just not going to happen, unfortunately. BUT, free hotel stays are possible as you can see if you make it a habit to sign up for the hotel chain’s credit card and loyalty program. From being loyal to a hotel and/or signing up for a credit card, I would have to say one of my personal favorites is simply by signing up for a credit card and taking advantage of the bonus by paying my everyday bills. Honestly, this is the EASIEST way to earn 5+ hotel nights with a certain brand just by spending the money you already were planning on doing so. Plus, some even give you a free hotel voucher every year, which is a HUGE perk if you use it wisely. Aside from the credit cards, it also doesn’t hurt to sign up for the hotel loyalty programs mentioned above since they are 100% free and you were going to stay the hotel anyways. You might as well earn points, right? I know. This isn’t 100% free, BUT it can earn you a free hotel sooner or later. In the end, earning a free hotel stay is possible, but it’s going to take a pinch of work on your part. If I’m missing any strategies, do let me know as I would love to add it.